The positions are closed based on multiple algorithms (when the price approaches the opposite boundary of the Bollinger Bands channel, when the maximum position holding time expires, etc.). Thus, waiting out of drawdowns is eliminated. Average position holding time is 5-8 hours. 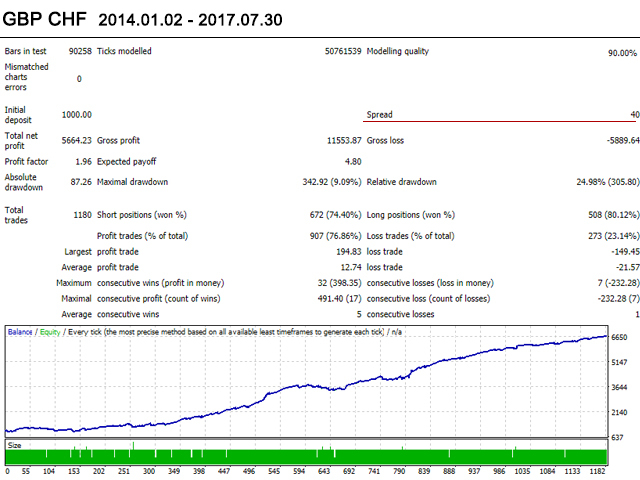 It is recommended not to use brokers that widen the spread by more than 40-50 pips (5 digits quotes) at night. To ensure better results please use ECN accounts. Currency pairs: AUDCAD, EURCHF, EURGBP, GBPAUD, GBPCAD, GBPCHF, GBPUSD (individual settings are required for each pair). Switch Trading System - enable/disable the EA. Lot size - trade with a fixed lot (if Auto lot = false). Auto lot - enable/disable the automatic calculation of the lot size in proportion to the balance (based on Lot size per $1000 of the deposit). Lot multiple after consecutive losses - lot multiplier after a series of losing orders. Lot divider - decrease the lot for orders opened on Friday (required for minimizing the risks, in case the open positions are transferred from Friday to Monday). Stop loss - target stop loss. Take profit - target take profit. Order Magic - unique number of an order. 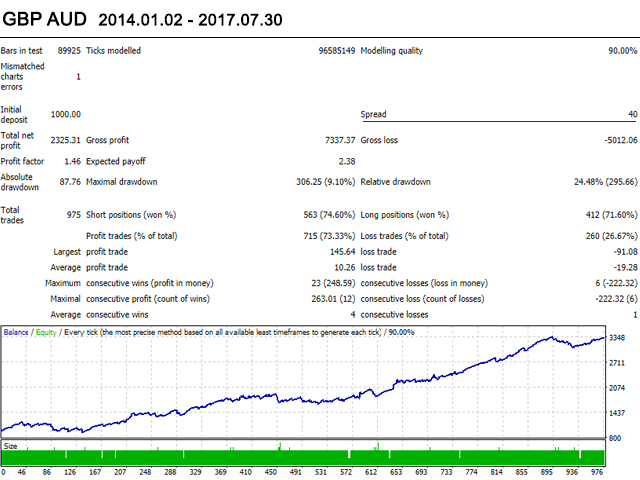 Maximum spread - maximum allowed spread in pips (5 digits). Maximum slippage - maximum allowed slippage. Open trading hour/minute - time to start trading (hour/minute). Start pause hour/minute - time to pause trading (daily session period) (hour/minute). Stop pause hour/minute - time to resume trading (daily session period) (hour/minute). 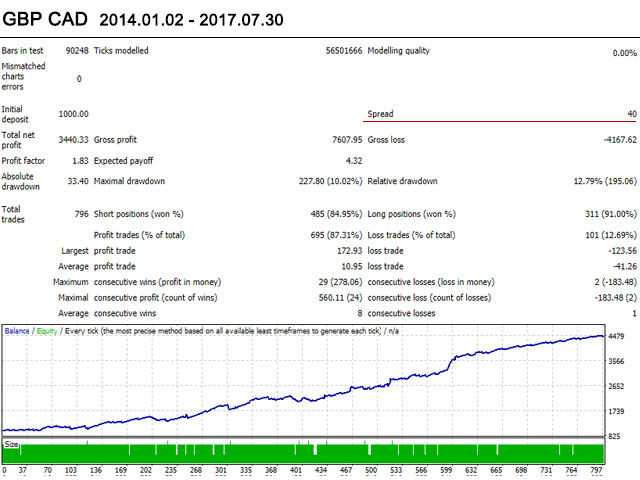 Close trading hour/minute - time to stop trading (hour/minute). The EA's operation time settings are set for GMT+3. In case the time settings of your EA differ, it is necessary to adjust these parameters.